I attended a wedding last week. While that might be a normal summer Saturday for you, it’s highly unusual for me. I don’t attend weddings; I perform them (four weddings and a funeral in the last five Saturdays). Weddings should make us love our spouses more. This is a forgotten benefit of a public ceremony. Not only does a wedding make the day special for the bride and groom as they make promises to God, one another, and everyone in attendance that they will live out their vows, but also a wedding can remind married couples of the vows and promises they made. 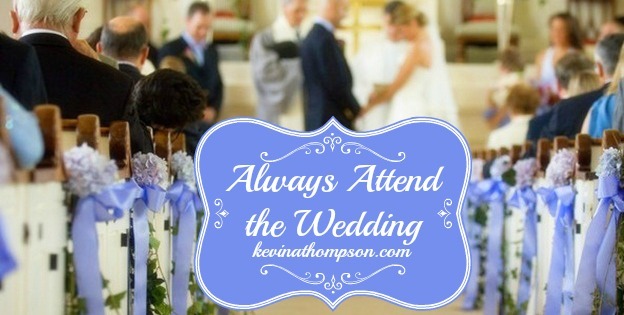 As I passed the groom in the hallway, I remembered my nervousness on my wedding day. As I saw the bride enter the church, I was reminded of how beautiful my wife was at the other end of an aisle. As the bride was escorted, I was reminded of how much my bride’s family loves her and my vows to her affect them. As I saw the soon-to-be husband and wife hold hands, I was reminded of how fortunate I am to have my wife. As I listened to them repeating their vows, I was reminded of all the times we had lived those vows out. As I heard them pronounced husband and wife and saw them kiss, I remembered the passion of young love. At each point in the ceremony, I was reminded of why I got married, how much I love my wife, and how important it is to work hard on our relationship. It’s easy in the hectic living of day-to-day life to allow feelings of love to fade. Thankfully, as quickly as those feelings can fade, they can also be replenished. A beautiful and fun wedding is a great way to be reminded of the depth of your love. I know weddings are rarely convenient. They often fall in the middle of your one day off (trust me, as a pastor I’m very aware of this). But if given the choice, attending the wedding is always a good idea. Attend not only in body but also in mind so that you can remember the value of your love for your spouse.